iPhoto version 9.6.1 remains compatible with macOS Sierra. screen shot courtesy of Coyote Moon, Inc. Upgrading from iPhoto '09 to iPhoto '11 is actually pretty easy. If you purchase iPhoto as part of iLife '11, just run the iLife '11 installer. If you purchase iPhoto '11 from Apple's Mac Store, the software will be automatically installed for you. One interesting wrinkle in the update process is that Apple at one time offered a free demo version of iLife '09. If you still have the demo version hanging around on your Mac you can use it to upgrade to iLife '11 without having to purchase the newer iLife suite. Before you install any iPhoto upgrade or update, you should back up your iPhoto Library. This is especially important with iPhoto '11. 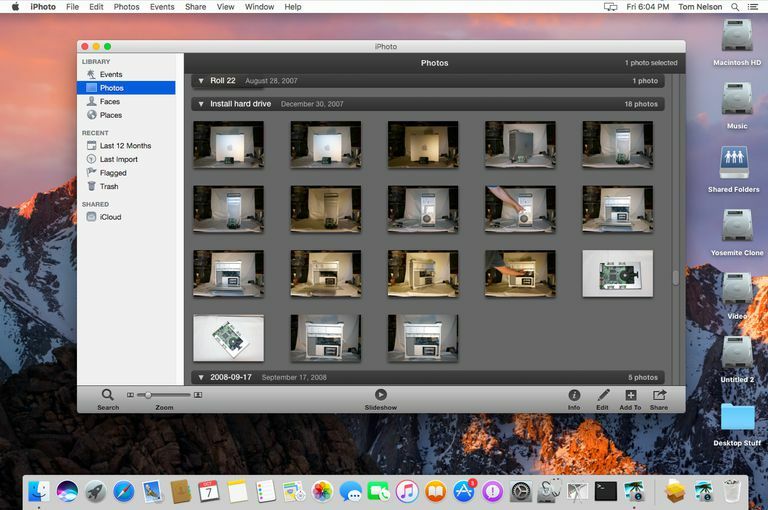 There was a problem with the initial version of iPhoto '11 that caused some individuals to lose the contents of their iPhoto Library during the upgrade process. By backing up your iPhoto Library before you upgrade iPhoto, you can copy the iPhoto Library backup file to your hard drive if something goes wrong during the upgrade process. When you relaunch iPhoto '09, it will update the library, and you can try the upgrade again. If you're not sure how to back up your iPhoto Library, our Backup iPhoto '11 - How to Back Up Your iPhoto Library guide will walk you through the process. (The instructions are the same for iPhoto '09.). You can also use Time Machine or a favorite cloning app such as Carbon Copy Cloner. If you prefer to perform a manual update, you can download the latest version of iPhoto at Apple's iPhoto Support site. Just click the Downloads link. Be sure to update to the latest version of iPhoto '11 before you launch iPhoto for the first time. While I won't call iPhoto obsolete, it is no longer supported by Apple, having been replaced by the Photos app with the release of OS X El Capitan. While Photos does not currently have all the bells and whistles iPhoto had, it is continuing to add features with each update. It also has the advantage that it is included with OS X El Capitan and the newer macOS. Apple is no longer updating iPhoto, however, it continues to work in OS X El Capitan as well as macOS Sierra. It remains available from the Mac App Store as a download provided you have purchased or updated the app through the store in the past. Just check the Purchased tab of the Mac App Store for the iPhoto app. If it is present, you can download the app. For complete instructions about redownloading apps from the store check out: How to Re-Download Apps From the Mac App Store.